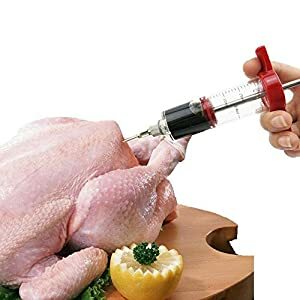 Home » Products » Awesome Meat Injector Aluminum-Free – Creates the Juiciest Turkey and BBQ ever! 2 Cleaning Brushes + 100% Food-Grade Materials – Guaranteed to Keep Your Family Safe! How many times have you prepared a roast turkey, BBQ’d steak or grilled chicken only to find it dry and flavorless? Frustrating, right?? Well now there’s an easy solution! 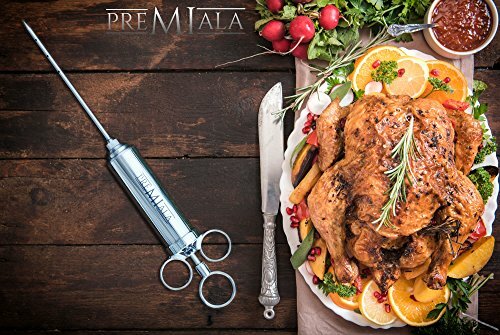 The Premiala Turkey Injector pumps marinade, wine, spices, garlic, Cajun, brine or pretty much anything you like DIRECTLY INTO the meat to give you the juiciest meals ever. It’s the trade secret used by professional chefs everywhere, and your family and friends will be amazed when they taste the difference! 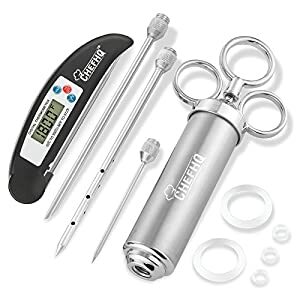 It comes with a fine steak needle for injecting thin cuts of meat, plus two six-inch needles to flavorise the largest cuts of meat. 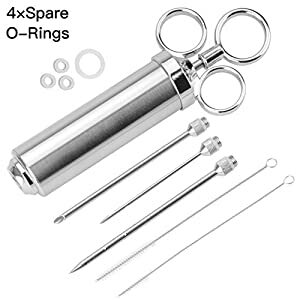 There’s also a fantastic instruction and recipe e-book to give you guidance and inspiration, and five spare silicon o-rings to give you years of faultless service. 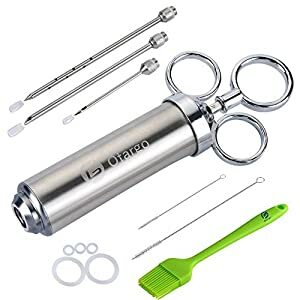 Finally, only Premiala includes two custom needle brushes for effortless clean-up so your needles are spotless for the next roast! Wondered why others are so much cheaper? As the saying goes, “You get what you pay for”. Even some others who claim to use ‘stainless steel’ still slip in cheap, non-food-safe materials like aluminum and brass for some inconspicuous parts (see picture 3). 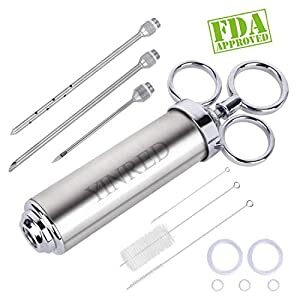 Not with Premiala – every marinade-touching component of Premiala’s food injector is 100% food-safe 304-grade stainless steel. Guaranteed to keep your family safe for years to come! 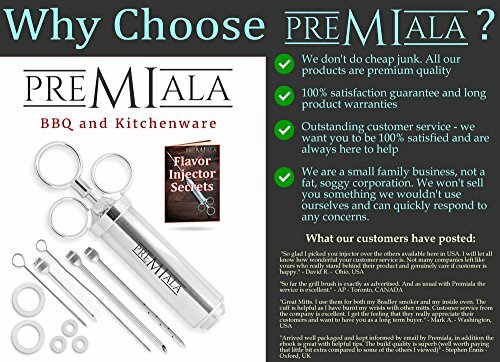 Premiala backs this product with a 12 month warranty, which you can extend to a lifetime warranty by following the VIP sign-up instructions inside the box. So if you’re for any reason unhappy with the product, just return it for a 100% refund! You literally have NOTHING to lose! Why put up with dry meat for a moment longer? Hit that ‘Add to Cart’ button before they sell out again, then start planning a panorama of flavor possibilities to enjoy for years to come! 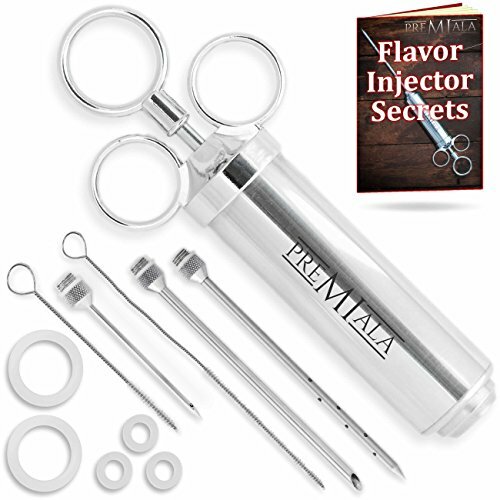 SAFER – unlike the competition, Premiala’s heavy duty seasoning injector is ALUMINUM-FREE! Only Premiala uses 100% food-safe 304-grade stainless steel for every component which touches the marinade. Guaranteed to keep your family safe! 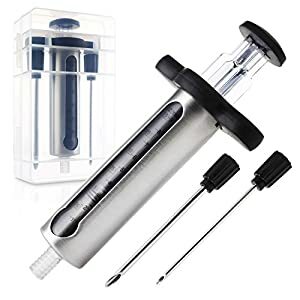 FASTER – Premiala’s 60ml marinade injector kit pumps flavor and moisture deep inside turkey pork and BBQ cuts for the juiciest most succulent dishes your guests will ever have experienced! WAY more effective than just soaking in marinade – and they make great gifts for men too! MORE VERSATILE – Don’t be held back by a basic kit! 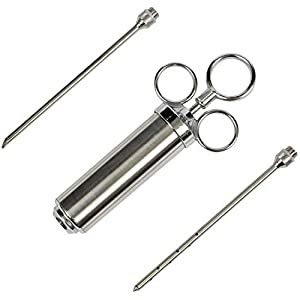 Premiala supplies THREE NEEDLES of different styles with ultra-sharp tips for effortless injecting in its meat injector kit, PLUS custom NEEDLE CLEANING BRUSHES. 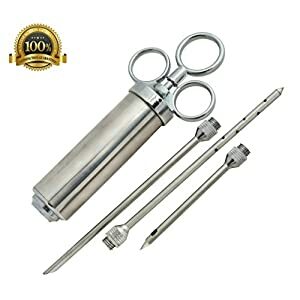 The precisely positioned needle holes make them perfect for injecting jelly into donuts rum into strawberries or brine into home-cured meats! 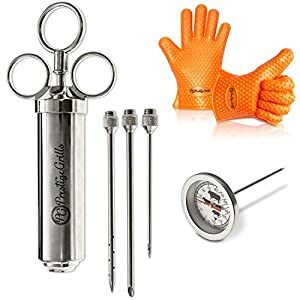 HIGHER QUALITY – Premiala’s extensive use of heavy-gauge 304 stainless steel means you know straight up you’ve purchased a high quality tool not a cheap flimsy toy. It also includes spare silicon o-rings to keep your investment going for years and is backed by a solid warranty! BETTER SUPPORT – Premiala has carefully prepared an extensive e-book to carefully guide you through every part of the injecting process. 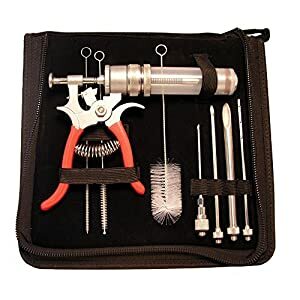 This e-book is a gift to you with your flavor injector kit! It also includes many recipes to get you off on the right foot as you start your own flavor journey!